If dresses just totally aren’t your style, you can opt for a super classy/casual look with a nice pair of jeans and top! 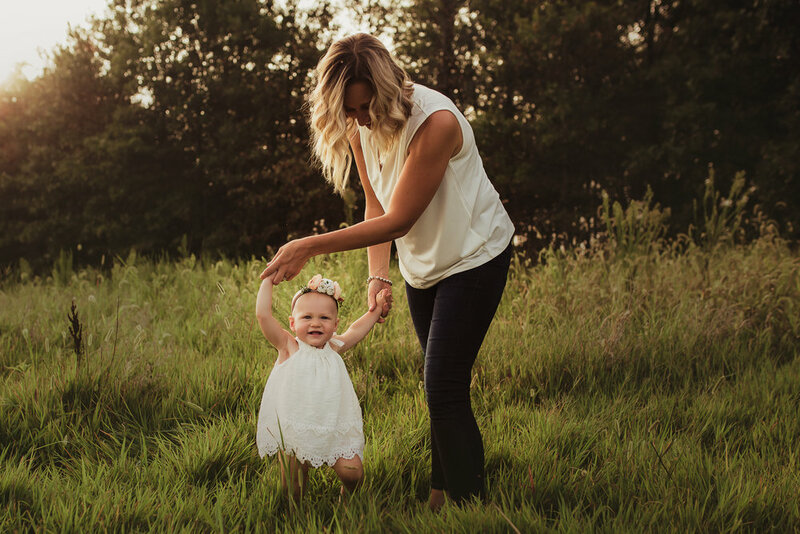 Brittany here has the prettiest flowy white tank top and it looked incredible alongside her daughter’s lace dress and floral headband. Perfect summer wardrobe! Over the weekend we talked about how to find your style, coordinate a color palette, and incorporate lots of texture to create a beautiful wardrobe for you family photos. If you missed that, you can find it here! I’ll be adding some photos of style examples that DO work for some inspiration. Let’s get to it! Are you a fan of neutrals? The Benton family killed it for their in-home session! Gorgeous neutrals with soft textures. Just perfect! Again, typically people don’t do this anymore. The whole white polo with jeans fad is a thing of the past. In addition to this, always think coordinate vs. match. So basically, not everyone should be wearing the same pattern, color, texture, etc. We’re definitely looking for some diversity in our wardrobe choices, but this doesn’t mean choose 5 different patterns and colors necessarily. For example, let’s say mom is wearing a floral printed dress. We would want to avoid having ALL of the kiddos wearing dominate patterns. I usually like to say that 1-2 coordinating patterns are great to add a little mix with the solids. For your fall sessions, I’m just gonna leave this here: try not to show up with every single person wearing plaid. You all will look like one massive plaid blob. We don’t like plaid blobs! We all are built differently and what looks good on one person won’t necessarily be the right fit for another! With this being said, choose something that you know you will be comfortable moving around in. You may find the most incredible dress but if you’re left pulling at it constantly to adjust then you won’t be able to fully relax and be comfortable during your session. You’ll thank me later for listening to that one. Biggest piece of advice…have every single person in your family try on what they are going to be wearing long before your session, and maybe even a week before as well. Kids grow so quickly and you definitely want to make sure the cute little outfit you purchased still fits! Okay I could go on and on with this topic, but I also want to add that you do not need to wear all baggy clothing with no dimension to feel comfortable in front of the camera. While you probably don’t want to wear a skin tight dress for your family session, you also want to avoid wearing something that just looks like a bag. I know baggy clothes can be so comfortable, (hello you’re talking to the girl who is always wearing sweatpants and sweatshirt! ), but they just don’t photograph well on anyone. Everyone has a figure and you want to show it off tastefully! Okay…I’ll be done. This family is a prime example of using patterns and rocking them! Their eclectic style shines through without overwhelming the scene whatsoever. With mama in a beautiful vertical striped/lemon patterned dress, dad in shorts with a very subtle pattern, and baby boy in all solids, (and suspenders…speaking my language there! ), their look came together perfectly.